Fun-to-drive aspects of the GS prototype start with a refined platform that’s stiffer via added gauge and additional reinforcement here and there as well as an increase in spot and laser weld points. A newly designed unequal-length A-arm front suspension both widens the track by 1.6 in. and also sheds 4.4 lb., a significant portion of this being unsprung weight (the minimization of which aids road holding). At the rear, there are separate coil spring and shock mountings; this, to optimize their functions. There’s also a rear-placed toe control arm that plays more than a passive role when the car’s optional Dynamic Rear Steering is fitted. The two prototypes differed in tire size, 235/45R18s on the lesser one, a front/rear split of 235/40R19s and hefty 265/35R19s respectively on the sportier one. The latter also had the full-house handling package with Lexus Dynamic Handling, Variable Gear Ratio Steering and the Dynamic Rear Steering already noted. The F Sport package for the new GS looks like a significant performance upgrade, sounding closer to the LS 460 Sport than the IS F Sport package — it will be interesting to see if any of the handling upgrades will be available on the standard GS as well. I also got to fool with Lexus’s latest Drive Model Select. 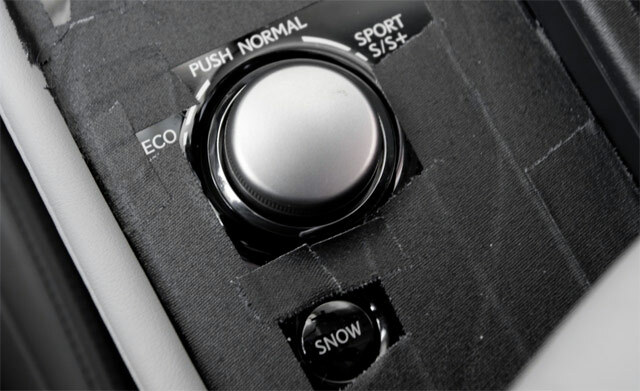 A rotary knob on the center console gives options of Eco, Normal, Sport S and (if optionally fitted) Sport S+. The two Sport modes firm the suspension, modify steering feel, finesse the traction/stability control and affect shift schedules. If I had my dritters, I’d make S+ settings more aggressively recognizable. A center-mounted shifter has a left-gate slap-shift feature that’s also invoked (easier, I say) by steering-wheel paddles. Like the best of such systems, this one blips throttle artfully on manual-range downshifts.